COLOR(S):Black, blue, fawn or brindle. With or without white markings. The Staffordshire Terrier is a very muscular, stocky, yet agile dog. It is extremely strong for its size. It has a broad, powerful head, short muzzle, and very strong jaws. The Staffordshire Terrier is powerful, reliable, and very protective. With its own family it is devoted, gentle and loving. This dog is courageous and a tenacious fighter if provoked. Training can be a challenge because of its pushy yet sensitive character. 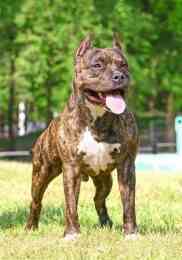 Its natural temperament towards people is gentle and loving, unfortunately some have been improperly handled giving the Staffordshire Terrier a bad rap. It should never be confused with the Pit Bull Terrier. Classed by AKC as " Staffordshire Terrier" and by UKC as "Pit Bull Terrier." The Staffordshire Terrier, is generally of larger bone structure, head size and weight then its cousin the Pit Bull Terrier. The Staffordshire Terrier is a good-natured, amusing, extremely loyal and affectionate family dog. It is good with children and adults. It is a courageous and persistent fighter if provoked. It needs firm, kind training to control this instinct; its basic temperament towards people is gentle and loving. It is almost always obedient; this dog wants nothing more then to please its master. It can be difficult to housebreak. This is not a dog for a timid owner; it needs a firm, consistent, but gentle hand. This breed is an intelligent, excellent watchdog and guard dog that is very full of life. This dog is highly protective of its owner and the owner\'s property; it will fight an enemy to the death. It has given outstanding results as a guardian of property, but is at the same time esteemed as a companion dog. It is very important to socialize this dog very thoroughly when young to combat aggressive tendencies and be sure to keep the dog under control when other dogs are present. This breed has a very high tolerance for pain. The Staffordshire Terrier must have plenty of regular exercise, but keep it leashed in public to avoid fights with other dogs. This is not a breed for placate or overbearing personalities. Cataracts, entropion, over heating and breathing problems. Staffies need plenty of regular exercise which should consist of play time and daily walks on a leash. They should be kept on a leash in public places. The Staffordshire Bull Terrier is a quick learner, but they may be stubborn at times. Consistent training from puppyhood is the best approach. The Staff Bull Terrier needs to be socialized to other animals in order to accept them when it gets older. They are not averse to a scrap with another dog. Learning Rate: High. Obedience - Low. Problem Solving - Low. They can learn, though stubborn as they are.